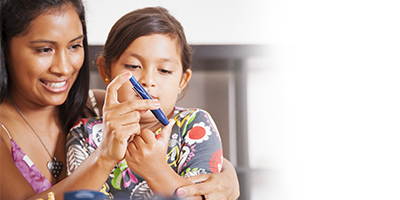 Type 1 diabetes is an auto immune disease where the body does not produce any insulin and usually occurs in children, adolescents or young adults. Only five percent of the people with diabetes are affected by this type of diabetes. The pancreas, a small gland behind the stomach produces insufficient insulin to regulate the blood glucose levels and hence daily administration of insulin becomes necessary. This is because the immune system attacks and destroys the insulin producing cells. Generally, the immune system produces antibodies that fight infections from harmful bacteria, viruses and other microbes. In the case of autoimmune diseases, the immune system starts producing antibodies that instead of fighting infections attacks the body’s own tissues and structures as if they were foreign. If you are diagnosed with Type 1 diabetes your body produces antibodies that targets and attacks the beta cells in the pancreas, which produces insulin. Since insulin is essential to sustain life, the missing insulin has to be replaced in the form of insulin shots or by using an insulin pump. Insulin therapy aims at preventing the complications from diabetes by keeping the blood sugar levels within the normal range. However, this therapy can cause complications like hypoglycemia, lipodystrophy at injection sites, weight gain, allergy or hypersensitivity to insulin. People with diabetes are ordinary people living with an extraordinary condition. An understanding of diabetes and the lifestyle changes makes living with diabetes easier and puts you in the driver's seat.